Your business can rise or fall based on the relationships you build with your customers. But are you ignoring the other essential relationships…the ones with your suppliers? Collaboration has become a key component for success in a business environment that is increasingly global. Collaboration leads to transparency into transactions and trust between stakeholders. Internal collaboration between procurement and accounts payable, made possible by automating the P2P processes, has led to very positive results. Without automation, both functions within the company rely on paper-based and manual processes which are prone to errors and delays. The visibility, speed, accuracy, and transparency that come with a robust automation solution enable finance to better manage cash flow and working capital. Visibility into invoice and payment status helps you and your suppliers. The same situation holds true for suppliers. They also want to find themselves better able to manage their cash flow and working capital. Knowing exactly when an invoice will be paid and being able to track that information enables them to gain control over both cash flow and working capital. This is why any solution you implement must have a supplier portal that gives suppliers instant real-time access to the status of their invoice and payment. It’s important to remember that your suppliers want to profit just as you do, so negotiations should always be looked at for a win-win outcome for both you and the supplier. The fact is that a business relies on the cooperation and goodwill of its suppliers. They should be regarded as trading partners, and procurement should never enter into negotiations thinking that it is a zero sum game. That doesn’t mean you shouldn’t negotiate the most advantageous prices and terms possible for your company. With that in mind, it is imperative to deploy a system that provides both buyers and suppliers with full visibility into the status of a transaction in real-time, from PO issuance to final payment. The streamlining and optimization of processes through electronic purchase orders and e-invoices does more than just speed up the time that invoices are paid; it actually increases operational productivity and enables strategic planning. Accurate, real-time information reduces the need for inquiries into when payments will be made. This benefits both buyer and supplier since personnel can be employed for more strategic tasks rather than chasing down payables status. Further assisting in strategic planning, a robust automation solution should offer analytics and dashboards which provide information to both parties that will allow for better inventory planning, smarter re-investment in the company’s core business, and identification of problem areas that can be handled sooner rather than later. Accelerated payments: Suppliers get paid faster and you hold on to your cash longer. When seeking for the best solution, companies want to find a third-party provider that offers more than simply a software solution. Look for a provider that has expertise in both procurement and accounts payable functions. Some third-party providers also offer accelerated payments as an option for large accounts, where the third party will guarantee payment to the supplier at an agreed-upon time and then accept the responsibility of receiving payment from the buyer. Suppliers know they will be paid on-time and buyers can work out more advantageous payment plans for themselves. This is the type of win-win I spoke about earlier. Collaboration with suppliers can do more than just engender goodwill, better pricing, and greater cooperation. Your suppliers have their own expertise and can offer advice that can improve operational efficiencies and savings in your own organization. Keep the lines of communication open because collaboration is not something you should consider only when contracts come up for review and renewal; collaboration should be an ongoing practice. 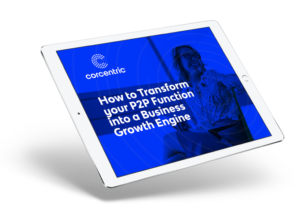 See how Corcentric can help unlock the hidden value within your enterprise.